Continuing on from earlier work (here, here, here, here, and here), I mean to narrate my process for putting together a draft of the sort students are asked to compose in their fifth week of the session. As before, I’ll not explicitly use the template provided by the University, though the results will still hopefully be similar enough to what the school requires that my students–and others’–will find my efforts helpful. Although not quite right, this is what most people think about when they think of revision. Image from Inside Higher Ed. 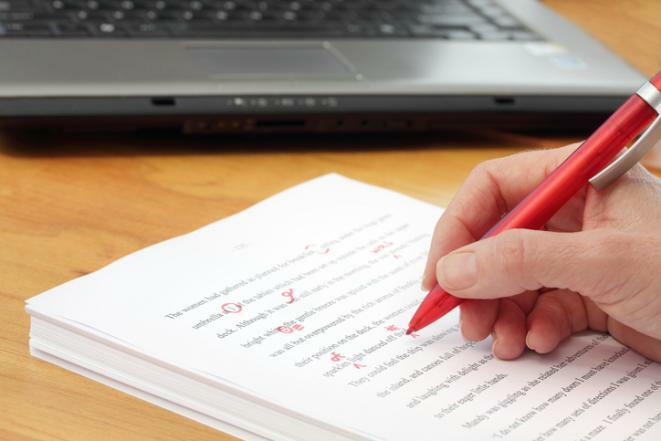 For the assignment, students are asked not so much to revise what they have already submitted as to add onto it, completing the paper begun in the first draft. As such, the assignment title is something of a misnomer; it is a second first draft rather than a second draft, as such. Rather than starting a new document and formatting it, I added onto the document I had generated for the first draft, making sure to save the new version under a different name (i.e., replacing “First Draft” with “Second Draft” in the file name). I made similar adjustments to my title page and first page of actual text, ensuring consistency across the material being developed. I also marked the prewriting for deletion from the current exercise, as it is not called for in the putative second draft, but I retained it at the outset of development due to its notes for expansion. I then moved to the end of the already-written text, placing the notes for expansion I had on hand where I could use them most readily. Noting that doing so brought up a source for which I had an annotation but had not yet included in my document, I made sure to enter that source’s citation into my references list, ensuring that I would not forget to do so. The citation came, as had several others, from my earlier annotated bibliography–and, since I was working on that part of the paper already, I decided to develop that idea for a bit (working from the summary and earlier discussion in the annotated bibliography, as well as from the original article) to see how it could work. That source introduced and put to the service of my stated thesis, I moved back up the page and addressed the other development note I had brought down from the first draft of the paper. Its source was already in my references list, so I had nothing to do on that score, but I did pull up the original article again to be sure I all of the information available from it that I would need. Or I attempted to do so; library services disallowed access to the article I needed, despite my having logged into the University’s library. I was obliged to put that part of the work aside for a time as a result, which rankled. Fortunately, there was much else for me to do. I realized swiftly that I had exhausted my previously-acquired resources and, given the difficulties I had had with the University library, I turned to an open online search to help fill the void. Doing so led me to Google Scholar, where I searched for “supporting community organizations,” restricting the initial search to pieces published after 2010. Unfortunately, the results that came up were located behind paywalls, but I recalled that my local library has database access, so I ran a similar search on its databases, adding restrictions to articles, book chapters, and case studies. One article suggested itself for inclusion in short order; information was integrated from it. That done, I used my local library resource to pull up the article I had earlier searched for in the University library. I was able to bring it up without any trouble, and so I integrated the materials I needed from it into my essay, as well. As doing so took me to the end of my notes from earlier, I deleted the prewriting materials; they had outlived their utility to my present purpose. Still needing more support to make the case, and needing information more narrowly targeted to the specific thesis with which I was working, I ran another outside search. It was a simple Google search for “community band.” More than 693 million results were returned, but the first page offered enough material–or a gateway to enough material–to make a reasonable case. Information was culled from websites to make the necessary case–as well as to generate the graphic for which the overall assignment calls. (The second draft in itself does not, but it is not a bad thing to look ahead when composing a project in explicit stages.) The information was entered into an Excel spreadsheet and used to generate a graphic that was subsequently cut-and-pasted into the Word document in which I did my composition. Necessary figure data was incorporated, as well, and citations for the sources for my graphic’s data were integrated into the references list. As I reviewed assignment guidelines to ensure that my work would continue to serve as a useful guide for my students, I noted comments that only the latter sections needed to be developed in the second draft. To align my work more fully thereto, I deleted the text I had developed for the first draft–although I did not adjust the references list further. Looking at the document at that point, I noted that I had enough material developed to move on to a conclusion. My earlier materials had pointed towards final remarks looking for a call to action. I drafted my conclusion with an eye towards my own purposes and my own ensemble; I have an idea for how I might further expand it for a final draft, if I find I need or want to do so. With the content compiled and directions for further development set, the formatting was re-checked to ensure ease of reading. A review of content for style was conducted, as was proofreading. All that done, the document was rendered into an accessible format, presented here: G. Elliott Sample Second Draft September 2018. Your help continues to be appreciated. Please give.